If you are planning to go in for the Advanced Social Media Certification Training, then you will be glad to know that there are no as such prerequisites for pursuing this course or to take this certification. This course is available for all and sundry. It can be undertaken by the one who wishes to enhance his Social Media skills as you are sure to benefit from the training that you will receive through this particular course. 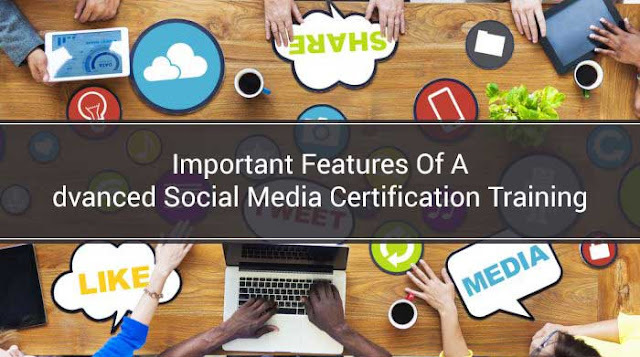 prior to taking this course you must go through the Important Features Of Advanced Social Media Certification Training that we will be highlighting in the given article. Though you might find many institutions that will provide this course but in case you want a decent suggestion then we would recommend going in for doing this course from the Simplilearn's social media certification training. There are umpteen reasons to justify the same and many of these will become evident in the paragraphs to come. For further details you need to read the highlights of the article. If you go in for the social media certification training you will be able to enjoy 20+ Hours of quality e-learning along with the 9 Mini projects that you will get to do. Not only this but you will have an access to the downloadable e-book along with the practice test as well as the assessments. Besides, you can enjoy the comprehensive and the up-to-date content. To highlight few of the topics, you will be covering the content on Measurement, Storytelling, Social Media Selling as well as the Influencer Marketing. The Advanced Social Media course is basically focused at educating as well as training the participants in the field of Social Media that is advancing by leaps and bounds and is expanding every single day. The learners will be able to get a training in the latest as well as the most advanced techniques that will prove beneficial in the times to come. Here, you as a learner will be able to develop as well as enhance skills in attracting the traffic to the desired websites along with promoting as well as protecting the brand and the online reputation. The major aim of the course is to educate the learners as well as train the participants on the effect of E-commerce and on how the Social media has altered the businesses specifically in the field of marketing as well as communication. This course also takes into consideration the concept of the sales channels as well as on the issue of how the same relates to the present Social Media goal of the brand you own which is inclusive of the micro-goals. The course intends to serve variety of purpose, though the major one remains to excel at the using the social media for your advantage. Here the participants get trained in drawing more traffic in addition to generating the visibility as well as the awareness for the brand or the product. Apart from this, you will get to learn the advanced social media communication principles plus the platforms. You will also get the brief understanding of how the emotions of sharing leads to affect the social exposure in addition to studying the reason of why the social media strategies need to originate from the business goal. Identifying the potential social media metrics with regards to a campaign by detailing the three key areas of the business which the social media has the power to impact is another benefit. You also get to understand the subtle as well as the intricate details of the effective social media marketing plus the effective implementation of the Social Media strategies plus tactics in addition to creating the marketing campaigns. Besides, you also get to learn the four ways so as to motivate the consumers by hitting the three key benefits of the storytelling when it hits on having the consumer engagement. The course also aims at attracting a greater audience and facilitating communication with the influencers. Also, you get to learn to deploy the latest strategies so as to plan, execute as well as assess a comprehensive plus effective social media campaign for the corporations, the government agencies as well as the non-profit organizations. The course teaches you about identification of the four places that you need to monitor for the purpose of conversation about the brand you want to market and creating the list of KPIs so as to makes the measurement on the basis of the existing Social Media goals. Social media can be a boost to the promotion of any product or service, how so ever big or small it may be. Be it the Entrepreneur and business owner, Social Media Marketing Manager, Social Media Consultant, Public Relations/Brand Manager, Blogger/Social Media Copywriter, Media Relations Representative, Online Community Engagement Manager, Social Media Strategist/Specialist or the Public Affairs Officer, all of these professionals have the capability of becoming the social media specialists. All in all, these are the Important Features Of Advanced Social Media Certification Training. In case you look forward to have a career in this field then you can go in for taking this certification course. it will acts as the icing on the cake, as the skills that you already have will benefit from the proven certificates which will enhance your visibility in front of the recruiters. You will be in a win -win situation from all the side. This is so because not only will you be able to learn and enhance your skills but at the same time you will be able to have a certificate that will further modify and prove that you are a professional in the same. So, without any delay you must go in for doing the same today from one of the best places that you can locate in addition to the best institution.